Enjoy the privacy and natural light without blinds. 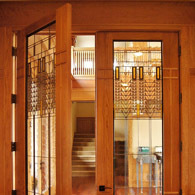 Install a stunning door that increases privacy and safety. Create pristine elegance and lighting in your hallway. Add character to your kitchen cabinets, windows & doors. Add personalized charm to any room in your home. Create an exquisite look in the front of your home. 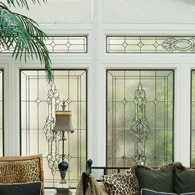 Watch the light amplify the room through these leaded windows. Incorporate detailed designs for a classic look in any room. Customize religious windows with ornate stained glass. Create sophisticated accents and detailed designs in any building. Houston Stained Glass caters to surrounding locations and provides the nation’s highest quality and custom built stained glass windows. 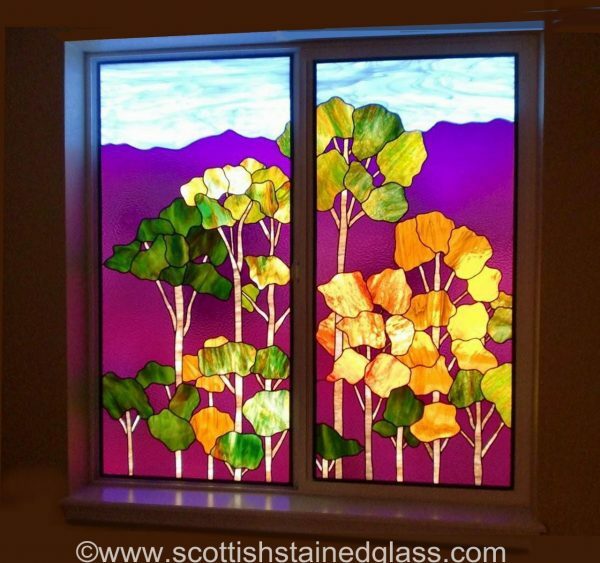 Scottish Stained Glass is the largest stained glass company of our kind in the United States and has spent the last 25 years providing one-of-a kind service to residential, commercial, and religious clients. Residential homes benefit from the leaded, textured, and beveled glass by adding an element of privacy and security in entryways and sidelights, transoms, bathrooms, kitchens, hallways and all other rooms in the house. We specialize in providing custom stained glass signage, repair and renovation, and new stained glass to meet exceptional branding needs to commercial clients. We also provide ornate designs for temples and churches of all denominations, sizes and styles. We’re the industry leader in religious stained glass restoration providing a necessary service that gives back to our community by restoring Houston church’s beautiful, antique stained glass to its former glory. 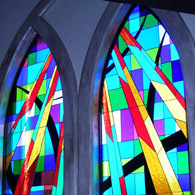 Religious stained glass is often a powerful part of the worship process giving various, personal messages to each individual in your congregation. 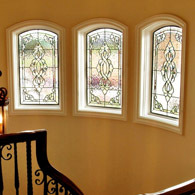 Restoration can add another century to your stained glass’ life while adding more equity to your Houston property. Generations to come will continue to be inspired by these one-of-a-kind religious stained glass panels and treasure them dearly. Our renowned restoration process has helped restore stained glass windows throughout the entire nation. Whether you are looking for a remodel, repair or upgrade, Houston Stained Glass can create the beautiful stained glass of your dreams. Contact us today to schedule your free on-site consultation and learn more about our design process, inspiring craftsmanship and the wow-factor we can provide in your customized space. It’s all about the details when it comes to stained glass. Every little detail is handcrafted with each individual in mind. These details can elevate your home’s curb appeal, in turn increasing your Houston home’s property value. Stained glass can transform your home by filtering that harsh Texas sunlight into beautiful prisms and soft, natural lighting. With endless design, color, and texture options, our custom stained glass service allow homeowners to bring their creativity to life. Our stained glass artisans are happy to help you design the stained glass of your dreams, enhancing curb appeal and adding home equity. Contact us today for a free in-home consultation regarding your goals and design ideas. We’re happy to help with projects of any kind ranging from kitchen cabinets to bathroom privacy solutions. 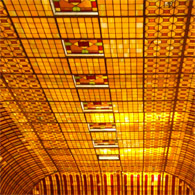 We look forward to working with you on your next stained glass project! Stained glass offers limitless opportunities that range from traditional, colorful windows to elegant, leaded privacy options. Stained glass is a great privacy solution for Houston homeowners looking to obstruct unwanted views without having to sacrifice light. 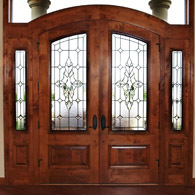 Sidelight Stained Glass Windows: Sidelights are long windows that run along the side of your entryway front doors. Utilizing stained glass within sidelights offers a wonderful privacy solution so that neighbors and onlookers can’t see into your home. 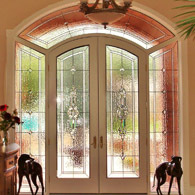 Stained glass sidelights deliver that desired grand entry look with an abundance of natural lighting. 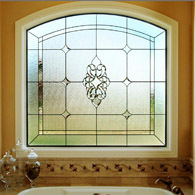 Bathroom Stained Glass Windows: Privacy is always a priority when it comes to your bathroom. 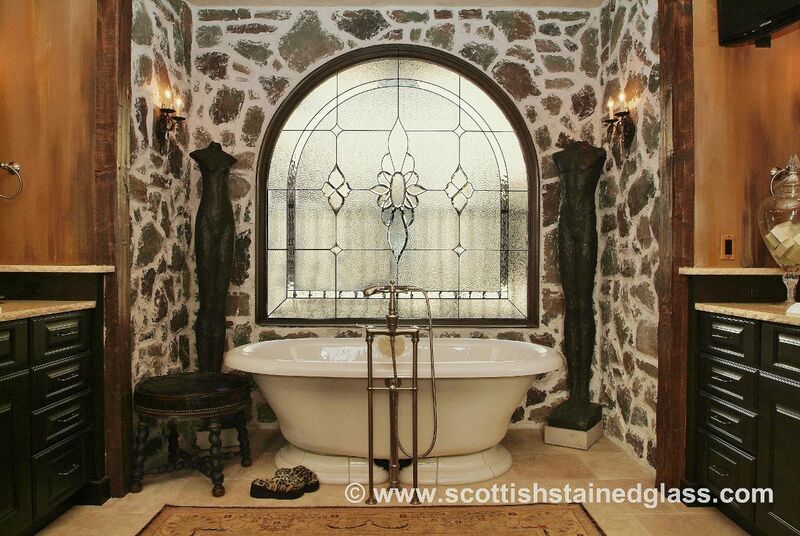 Make your bathroom the oasis you deserve by adding a beautiful stained glass feature. 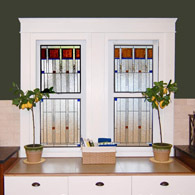 Stained glass provides the privacy and seclusion you desire while still allowing in high visible light transmissions. Get rid of your tacky window coverings that are susceptible to mildew and upgrade your Houston home’s curb appeal with a custom stained glass window. 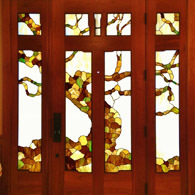 Entryway Stained Glass Windows: Entryway stained glass includes stained glass installation within front doors, sidelights, and transoms. 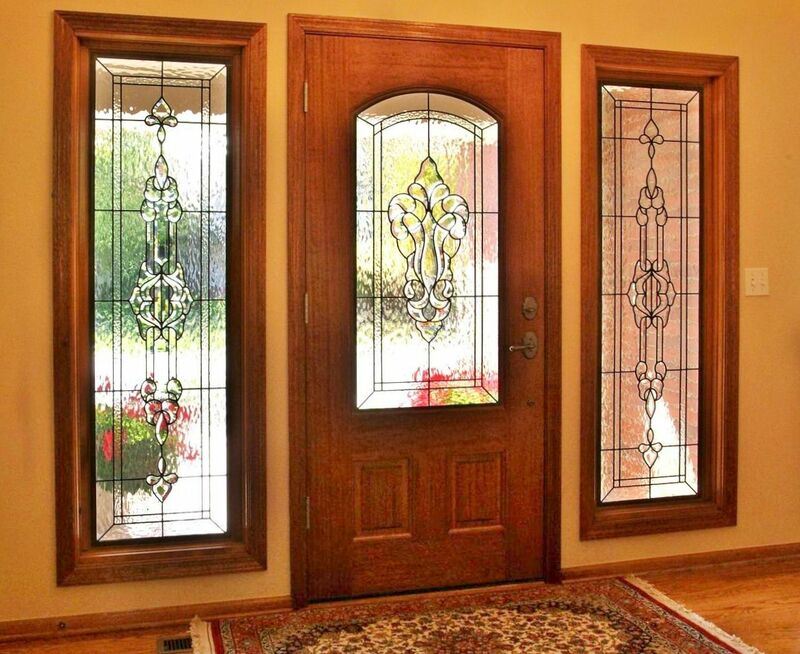 Completing your Houston entryway with beautiful stained glass additions heightens curb appeal, promotes privacy, and allows in that gorgeous Texas sunshine. 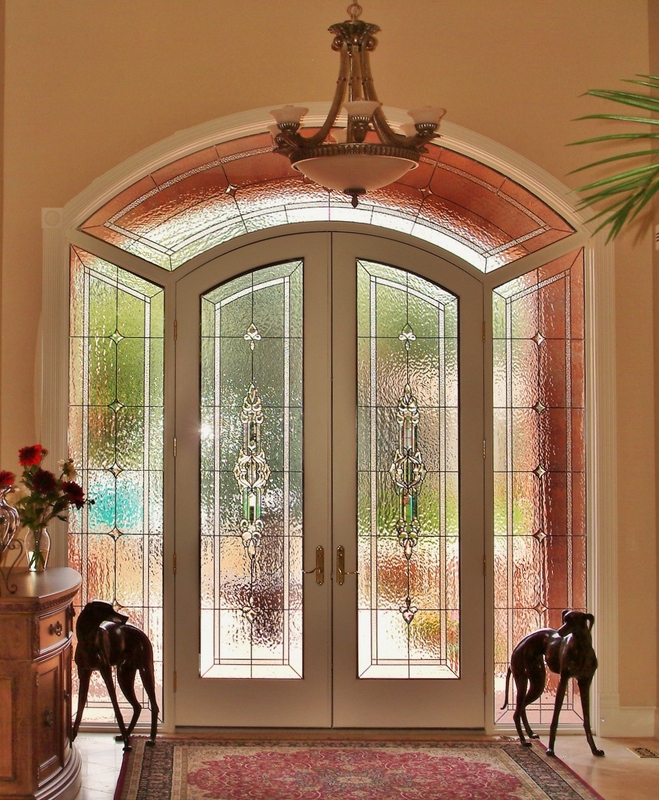 For the ultimate grand entryway, tie it all together with a complete stained glass feature.